NASA's Terra satellite captured this natural-color image of the blazing Blue Cut wildfire in Southern California midday on Aug. 17, 2016. Los Angeles is pictured by the coast, with three smoke plumes rising in the north. As a wildfire blazes through a mountain pass in Southern California, two NASA satellites were able to snap photos of the smoke from space. The Blue Cut fire, named after the hiking trail where the blaze began, has been spreading through the mountains and deserts east of Los Angeles since Tuesday (Aug. 16) morning. Two days later, the fire engulfed about 40 square miles of land, according to the Associated Press. Extreme heat, high winds and a persistent drought in the region are exacerbating the spread of the fire. 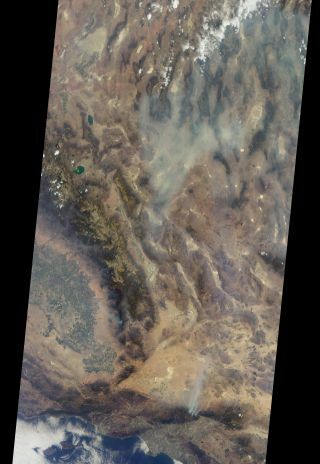 MISR's camera views Earth at an angle instead of looking straight down, which gives the instrument a better view of the rising smoke plumes than it would get from a conventional, vertical image. Terra's view shows the city of Los Angeles near the coast while three smoke plumes rise in the mountains to the north of the city. This satellite image, taken by NASA's Aqua satellite just 3 hours after the Blue Cut fire was first reported on Aug. 16, shows a massive smoke plume rising just north of San Bernardino, California. The day before NASA's Terra satellite captured its image of the wildfire, another NASA satellite flew over the area. This satellite, named Aqua, took another photo of the fire just 3 hours after the event was first reported. That image shows only one prominent smoke plume north of San Bernardino. The Aqua satellite used an instrument called the Moderate Resolution Imaging SpectroRadiometer (MODIS) to take this picture, which is also in natural color. But Terra was also able to see the actively burning areas, which are highlighted in red, using thermal-imaging techniques. Email Hanneke Weitering at hweitering@space.com or follow her @hannekescience. Follow us @Spacedotcom, Facebookand Google+. Original article on Space.com.